This simple crab pasta takes less than 30 minutes to make, but tastes like a lot more work went into it. The crab flavor mixed with a garlicky tomato sauce and sweet bell pepper flow together seamlessly in this easy, yet delicious pasta dish. 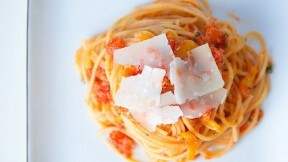 Marc Matsumoto of NoRecipes shares this recipe in a full post at the Fresh Tastes Blog. Add the olive to a frying pan and heat over medium high heat. Add the garlic, onions, and bell pepper and sauté until the onions are just starting to brown. Add the tomatoes using your hands to crush them along with the tomato paste, salt and pepper. Cover loosely with a lid and simmer for 15 minutes. Start boiling a large pot of well salted water and about 5 minutes before the sauce is done, boil the pasta. Add the crabmeat along with any juices, and then stir to combine. Adjust salt and pepper to taste. When the pasta is done, drain it well, and then add it to the pan with the sauce along with the parsley (or other herbs). Toss to evenly distribute the sauce, then garnish with shaved Parmigiano-Reggiano. Serve immediately.